I had seen the stadium in articles and news casts, and from a distance it appeared to be magnificent. At night with lights shinning upon it looked like a lost spacecraft which had landed on Earth. A circular structure like most other stadiums but this one had a disc suspended above the structure attached by steel cables. I was compelled to take a look at this stadium first hand. This stadium held more importance to me than the other 9 venues of the coming World Cup 1998. It is here where the opening games will be held, and where a new World Cup champion will be crowned. As I was traveling from Paris to the city of St. Denis by train, I wondered if this “Stade de France” was at least half as beautiful as it appeared in print. Although the ride was approximately 35 minutes from Paris to St. Denis my anticipation made the trek appear much longer. Finally arriving at my destination I exited the train and looking slightly to the west I could already see it. 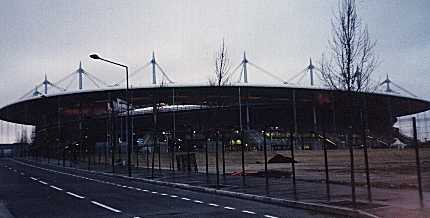 There it was, the Stade de France!. But I realized as well that the stadium was built in the center of a near ghettolike inner city. Also, if this stadium was to hold 80,000 people during World Cup I was at a loss as to where those vistors would reside during the games. 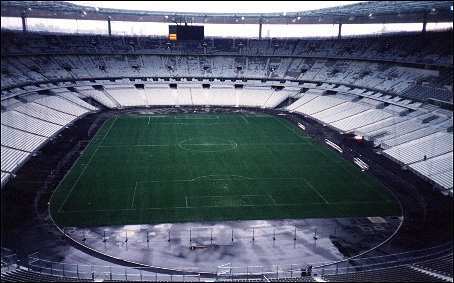 Although there was construction going on in and around the stadium area it could hardly be sufficient when completed to accomadate the more than 80, 000 fans who would attend the games daily. Nevertheless I exited the train and was approaching the by foot. It appeared to be approximately 1/4 mile from the train depot. While nearing the entrance area of the stadium it was clear that there was much work yet to be done, or at least ”those last finishing touches”. I observed the above worker welding what appeared to be a support wall. The administrative office was filled with curious journalist like myself wanting to get a closer look at this surreal creature. I spoke briefly with the stadium’s press director and obtained approval to access the entire area of the stadium including it’s interior. 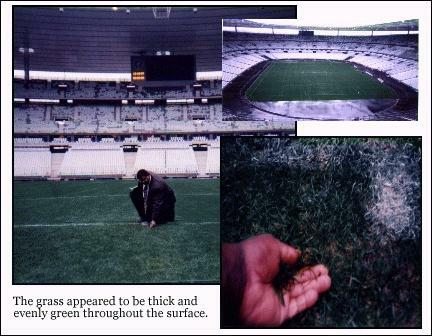 As our publication “La Cancha” focuses on the playing surfaces of World Cup and other such events, the grass playing surface was the first thing I inspected.. In just a few days, the stadium and it’s pitch would be inaugurated with a match between Spain and France. I wondered if the grass would be tall, or cut short to accomadate a fast paced match.?. What type of irrigation system would be used in the event of rain. And lastly, had the grass already turned brown and ugly as was a was widely the rumor throughout Paris. One Parisian had informed me that prior to the stadium’s construction, the land upon which it was built was a dumping site for various types of waste materials. 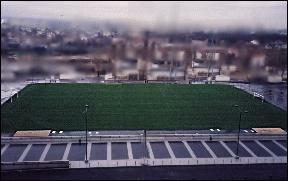 When the stadium was being built, a new grass surface was merely installed over the buried waste. 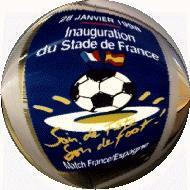 The new grass surface was grown several miles away in a village named Bourlon Marlottte near Fontainbleau. 9,600 slabs of grass were installed piece by piece over a ten day period. Each of the slabs of grass weighing in at 220 pounds was grown using a variety of grasses. This is usually done to produce a grass which is durable enough to withstand the rigors of world class level play. Costing over one million dollars the turf was designed to be as asthetically beautiful as the structure itself. But then (according to the locals ) something unexpected occurred. The grass began to turn brown. The locals believed that emanations rising from waste still buried below was creating havoc on the beautiful transplanted green grass. Thus, the money spent was considered by many to be a waste. The pitch reportedly looked terrible. However, when asking the stadium officials about the phenomena I was told that the grass had only gone through a natural color change. I was further told that any fear of toxic emanations which could harm the grass further or the players was totally unfounded. I decided to personally examine the grass. I did so methodically, inspecting it’s entire surface from one goal area to the other. I found the surface to be green and even throughout. Lifting a corner area of the grass near a drainage area it appeared to be green all the way to the root. Surely whatever problem exited before did not appear to manifest itself on this day. The surface and drainage system (below) consists of a deep layer of quartz sand followed by a thin layer of volcanic stone and finally two-inch thick slabs of grass. In the final analysis the grass surface was a beautiful thing to behold. Aside from the main grass surface of the stadium there is a special practice grass area built adjacent to the stadium. 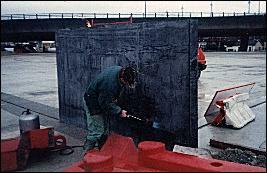 This was done to reduce the amount of wear and tear on the main surface prior to a major match. With the grass surface inspected as well as the general structure I then traveled to the top row to get an overall view . Upon my arrival at the highest level I was awstruck by the beauty of the stadium and the plush green carpet at it’s base below. The view of the seating levels and grass surface from that vantage point was more magnifient than I imagined. Even though I was on the top row, the ground level area did not appear to be too far. The players would probably not appear to be ants, due to the way the seating levels were designed. Before leaving, I visited the stadium’s ground level offiices. 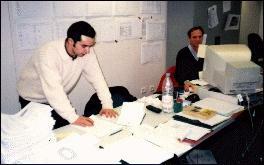 In one office specifically the Plannng Division I found several persons hard at work preparing for the up-coming inaugural match between France and Spain. There was also a store located on this same level where one could purchase soveigneers specifically designed for promotion of the Venue. In my estimation, the only thing that could make this stadium more beautiful is the atmosphere of the World Cup itself.